Dimensions:136W x 19D x 84 1/2H in. This sleek TV cabinet contains ample storage space and includes an ambient lighting system to enhance your viewing pleasure. Designed for flat panel or LCD televisions, this piece of home theater furniture allows for easy access to wires, so adding a video gaming consul or other device won’t be a hassle. In addition, its TV mounting bracket system is designed to be attached to furniture’s back panel, rather than to your wall. This way you can spend less time mounting your TV, and more time watching it. 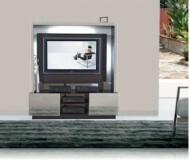 With many great features, this TV cabinet will make an excellent addition to your home. Easy-to-use TV panel mounting system. This allows you to easily mount your LCD or flat screen TV to the cabinet, rather than the wall. This way, you can avoid the hassle of having to find studs or beams, and don’t have to put any unnecessary holes in your wall. Ambient fluorescent lights for enhanced viewing. Current research suggests that when watching television in a dim room, having a light source behind the TV will enhance your viewing experience. With the flip of a switch, this lighting can be turned on or off. Easy Access to Wires. Wires are easily accessible, allowing you to add or change cables with little effort. Oversized Utility Drawers. With full extension ball bearing slides at the bottom, these drawers are perfect for holding DVDs or video game consuls. Pneumatic Door Lifts. Located at the top of this piece of furniture, this provides extra storage for your entertainment needs. Left and Right Storage Units. Each one of these units features a solid door with 4 wooden shelves on the far ends. Display/Storage Unit. This features either a frosted or clear glass inset with 2 wooden shelves and 2 glass shelves, as well as a backdrop light fixture to left of the TV section.